After getting out of the Army in 1971, I rambled around the country trying to find myself, never staying anywhere for too long. In the hot summer of 1974, I got engaged to Shirley Ann Holloway. I was working for Pinkerton Security at the time. One of my assignments was to guard a gated community in Newport Beach full of Hollywood bigshots and stars like John Wayne. Mr. Marion Robert Morrison (his real name - he never legally changed it) always waved to me when he drove thru. Sometimes he'd pause in his green Ford Station Wagon, and chat for a few minutes. Just general stuff. I remember complimenting him on getting an Oscar (1969) for his starring role of Rooster Cogburn in True Grit. In all fairness, I didn't keep up with the private lives of stars, so all I knew was The Duke was married to Pilar Pallette, a hot Peruvian actress with one movie to her credit. He asked me a few questions about Vietnam one day after finding out that I served there in 1970. Nothing too embarrassing. One day the subject got around to love. He was a bit cynical of it, and talked about two previous marriages that ended badly. I told him that I asked someone to marry me and she accepted. His face was a study of fleeting expressions as he digested my happy news. "Well...I wish you the best partner. I really do," he said. There was an odd look on his face that I only understood a few days later. 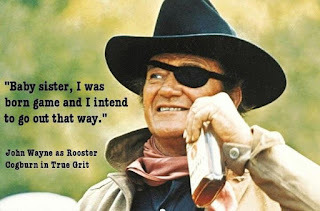 A friend told me, after I shared John Wayne's odd response to my good news, that Wayne was separated from his wife. The irony did not escape me. I was finally transferred to another job, a bank, a couple of months later. On my last day of guard duty in Newport Beach I saw The Duke for the last time. We wished each other luck. Five years later John Wayne died of stomach cancer...still just separated (not divorced) from Pilar.